The VehicleCounts.com PicoCount 2500 2 channel vehicle counter is designed with the latest in technology to give 250Mbyte+ memory, high resolution timestamps, over 10 year battery life, and no-setup-required operation, the PicoCount 2500 sets the standard for 2 channel air hose counters. 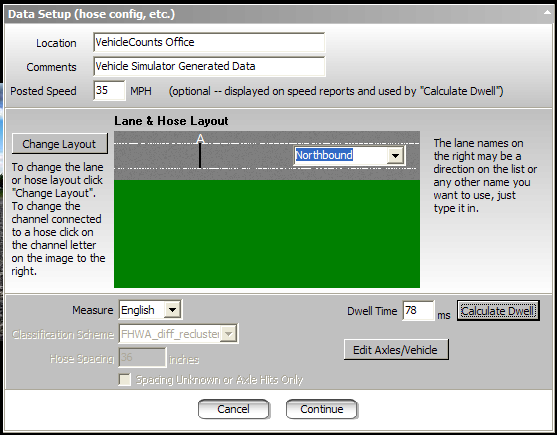 The Picocount interfaces directly to your PC using TrafficViewer Pro software for data downloads, unit configurations, reports and data exports. The TrafficViewer Pro software is free and is available here or if you wish to use the “Beta” version, you can get it from beta. This document is written with the assumption that you are familiar with automated traffic counters, their setup and usage. It also assumes you are familiar with the terminology used in the traffic counting industry. We now lead you through a typical study using the PicoCount 2500 counter and the TrafficViewer Pro software to familiarize you with both the hardware and the software. + This Quick start document. ** If this is your first unit, you should also have ordered a download cable which will be needed to interface to your PC. VehicleCounts.com offers a USB download cable (Part# VC-DC-USB). If you are using the USB download cable, the first thing you will need to do is install drivers for it. The USB driver install program may be downloaded from our website at www.vehiclecounts.com/downloads.html. If you are lucky, Windows will recognize the USB download cable and automatically install/activate the drivers and you will see a Windows info screen pop up saying "Hardware installed and ready to use". If this is the case, you may proceed starting TrafficViewer Pro. Make sure the USB download cable is connected before starting TrafficViewer Pro software. 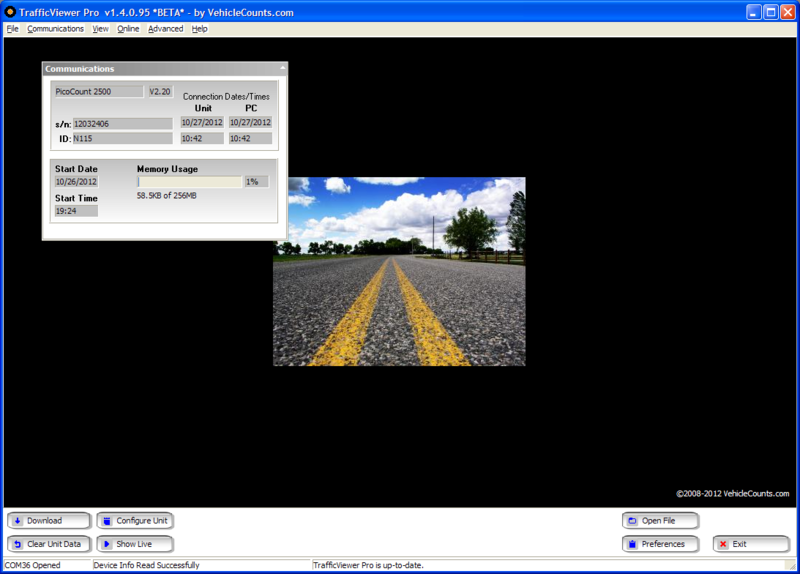 The TrafficViewer Pro software scans for all Windows® serial port connections (including USB) as it starts, if a new Windows® serial connection is made after the software is running, the software will not be aware of the serial connection. Occasionally, you might see the screen below pop up first, if so, just click on "Close" when it has finished (discussed in detail in the TrafficViewer Pro manual). Connecting to the PicoCount 2500. 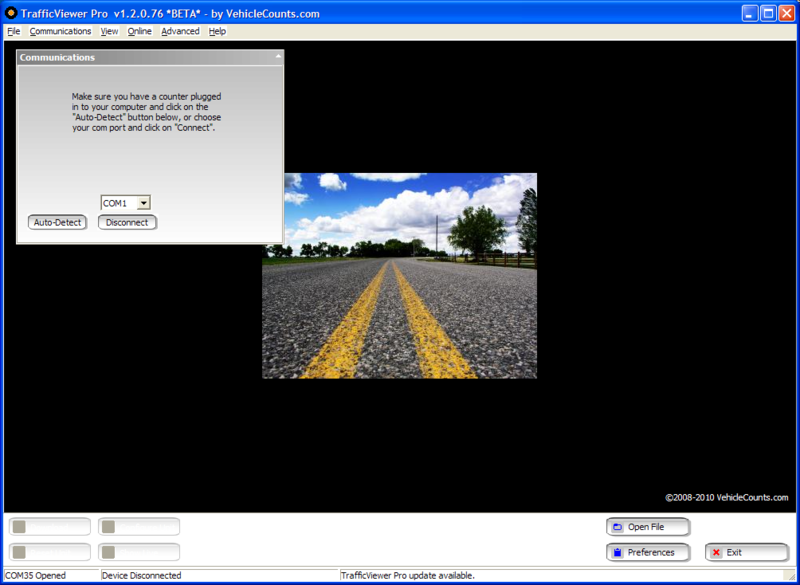 Once this screen appears, you need to clear the data in the counter by clicking on the "Clear Unit Data" button in the lower left of the TrafficViewer Pro screen. Clearing the unit data insures that any current data in the machine is discarded and most importantly that the date/time is synchronized with your PC. As a practice, you should always clear the counter’s data before setting it out for counts. This insures that you only have one study (or session of data) and it keeps the PicoCount's built-in clock "synchronized" with your PC. You are now ready to set the PicoCount 2500 out for counting. The PicoCount’s have no power switches and are ALWAYS counting, though no memory gets used if there are no "hits" on the air switches. For your first count study with this counter, we recommend doing a test study so that you become familiar with setup and data collection, before just going off and doing a critical study. 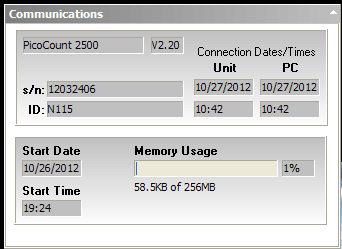 Set the PicoCount out like any other automated traffic counter (ATC). If you are new to using counters with air hoses, you should read the "Setting up the air hoses" section of the PicoCount 2500 manual first. If you are only needing volume data (vehicle counts, or axle counts), you may position the hoses in any suitable “volume” configuration (side by side, split median, long-hose/short-hose, etc.). 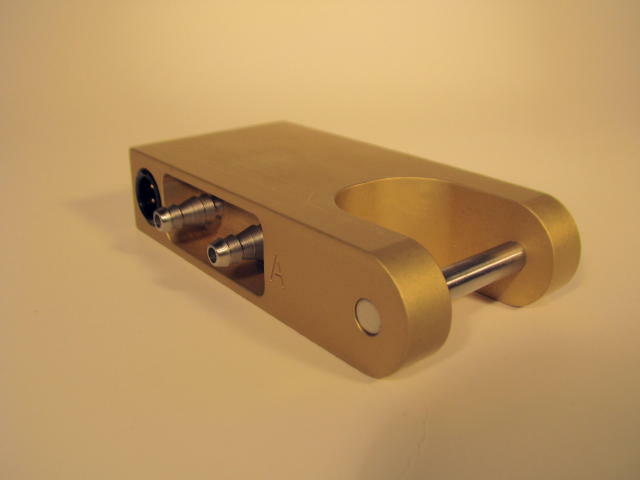 For volume only collection, spacing between hoses is not critical. If you are setting up for speed and/or classification, it will require pairs of hoses placed in parallel across the lane(s) at a known spacing (which can be anything from 1ft to 16ft, or 30cm to 500cm). If you don't have a preferred spacing, 3ft or 100cm are good options. Once the hoses are set, connect them to your PicoCount. There are two hose connections to the PicoCount 2500, the "A" hose, and the "B" hose. The "A" hose connection is the nozzle (barb) closest to the letter "A" embossed into the PicoCount. Once the hoses are properly connected, your study begins. As mentioned above, there are no switches to worry about, the PicoCount is always counting, so just let it collect data for the desired duration of your test study. First the Downloading dialog will pop up showing a progress bar of the download and when it is complete it will appear as shown above. 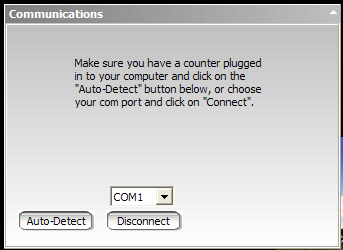 Immediately after the download is complete the Data Setup dialog will appear as shown above. Here you highlight the hose setup that best represents how you had the hoses set up for the study then click on “Select Layout”. There is a brief description of each hose layout on the right side of this panel. 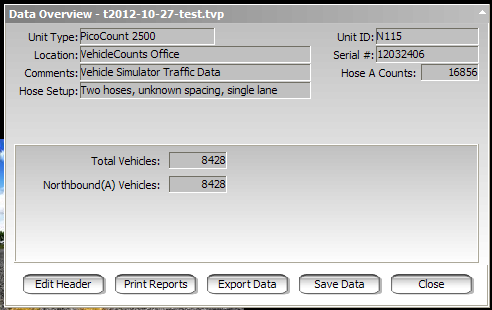 In our example data it was a single hose volume data from a single Northbound lane. The “Data Setup” screen now shows your hose configuration. The top three fields are optional. These fields are presented in reports, exports and saved data files, if they are filled in. Now select what direction the collected traffic was moving. NOTE! Keep in mind that if you make a mistake here, it in no way changes the data you have collected, only in how it is interpreted. If you got something wrong, you may return back to this window and “fix” the setup without having to download the data again. Since we are collecting volume data only several of the lower fields are greyed out. One field you can set is “Dwell Time” which normally is always the same value. If it is your first time, you might just click on the “Calculate Dwell” button and it will give you a good default dwell time for the configuration you have chosen. The other field which you can change is “Measure”. This field will present all speeds and data/times in either English or Metric formats. 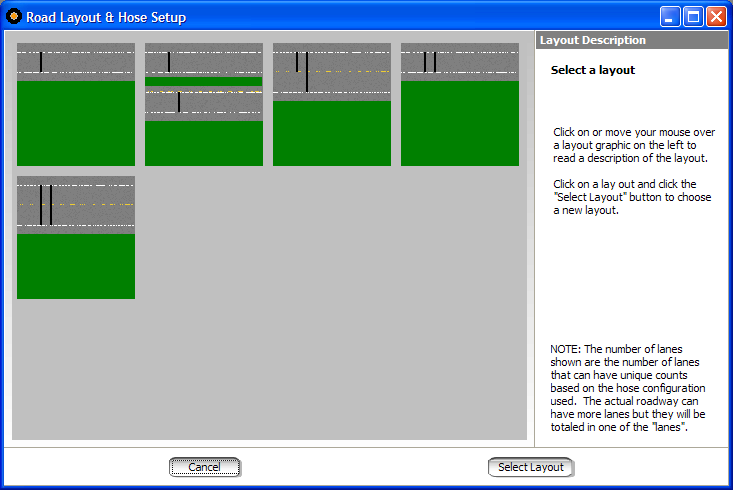 All the fields in this window are explained in detail in the TrafficViewer Pro manual. Once you are satisfied with the settings, click on the "Continue" button and a "Data Overview" screen will appear which has a thumbnail summary of the data you just collected. This screen is a summary of the data you collected in your test study. For our example data, it shows the volume of the traffic in the Northbound lane. At this point, before printing any reports or doing any exports, it is wise to click on the "Save Data" button to save a RAW data file. You should ALWAYS do this, even though you may not think you will need the RAW data again. 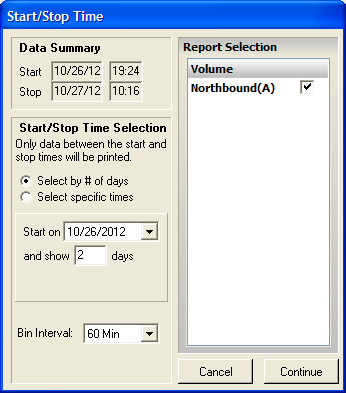 Select the time range of the report (by days, or by a specific range of date/times). Then specify the binning time intervals (normally 1 hour, sometimes other values). Finally check the boxes for the types of reports you would like. Then click on "Continue". 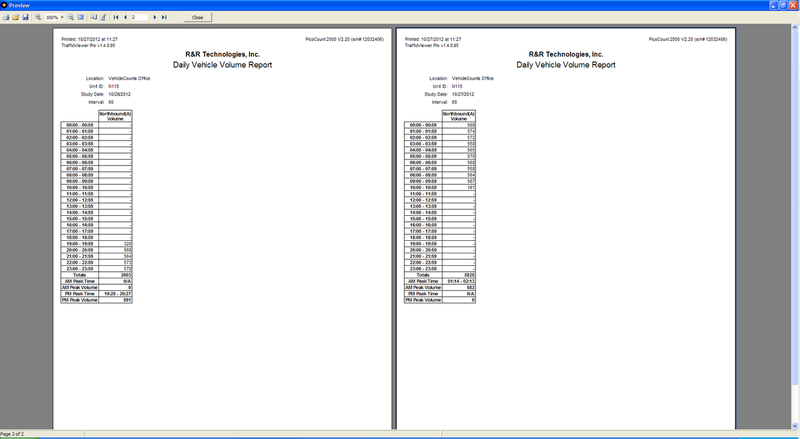 Now you will see a "Print Preview" of your selected reports. If these look good, you may click on "Print", else you may return back to the data overview screen (this way you can review the reports without actually printing them which can be very handy) by clicking on "Close". Once you are finished reviewing your data and printing your reports, you can close the "Print Preview" dialog by clicking on the "Close" button. Your data has been collected, downloaded, reviewed, saved, and reports generated. That is the basic operations in a nutshell. You are now ready to go out and collect data. Remember to clear the unit data before each new study. If you forget to do this, all is not lost, but it makes data retrieval a bit more messy. This is discussed in the PicoCount 2500 manual in the “When things don’t go right” section.